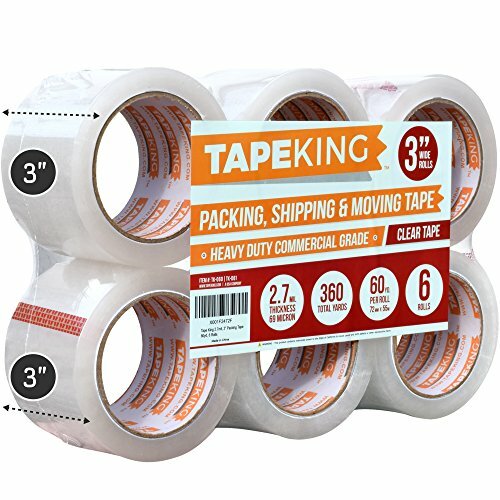 Tape King introduces our incredibly wide 3 inch clear packing tape - efficient, super adhesive, large wide rolls, covers more space and is here to make your packing, moving, shipping life easier. WIDER 3 INCH ROLL: Confused about all the measurements? The dimension of this tape measures at 3 Inch Width x 60 Yards Length or (76mm x 55m). The diameter inside the core is 3". Our tape is perfect for 3" wide tape dispenser guns or cut with scissors. GET MORE PRODUCT FOR LESS: 60 Yards per roll x 3" Wide. This packing clear tape offers you MORE TAPE PER ROLL and COVERAGE at a FRACTION OF THE COST of similar products. Why spend tons of money when you can get a total of 360 yards in a package of 6 rolls. With each roll having a good 60 yards of extra adhesive tape, this heavy duty depot tape is a true value for money offer. MORE TAPE COVERAGE: Our 3" carton sealing tape can be used for home removals, shipping and mailing, for storing and organizing household items, but also for anything that one expects from a household multipurpose tape. This moving and packing tape will always come in handy. When you use this packing clear tape you experience the beauty of PERFECT, EFFICIENT and EASY TAPING that promises MAXIMUM SEALING and PROTECTION for your goods as well as an AESTHETICALLY PLEASING result.